Lice also known as Pedicures humans capitis and head louse is an insect who uses us, humans as host. 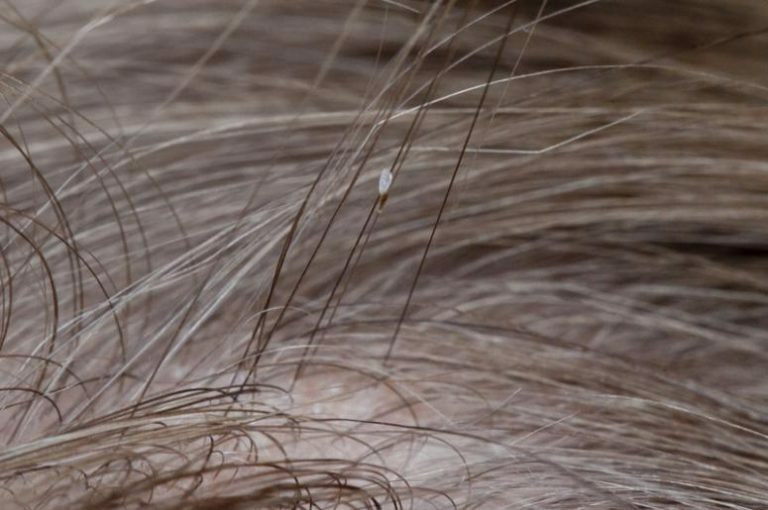 These lice are attracted to body temperature and they feed several times a day. Below you can see the different life cycles of the head louse to understand if you or someone you know has them. At what point is this insect in their life cycle. You will begin to discover how fast these pests can multiply, we discovered a homeopathic lice treatment which works extremely well for this pest and is being used by schools and health facilities since it has no pesticides or pyrethrin. Below is a video on what lice look like. We go further in our what lice look like guide. 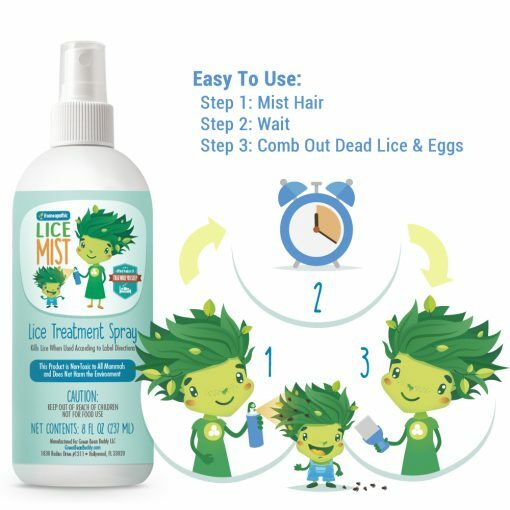 Please take a look to get a good idea if you or someone you know has lice. 1st stage of the head lice life cycle is the eggs or nits.. A bit difficult to see and usually confused for dandruff or hair spray. The weird thing is… female lice are stationed at the base of the hair shaft close to the scalp. This is because they love the warm temperature of the body. These nits are usually 0.8mm by 0.3mm and oval shape. The color of nits are most of the time yellow to white. The hatching time of nits is roughly about six to nine days. The second stage of the head louse life cycle is when they transform into nymphs. This occurs after they hatch from their eggs. You will notice the nit shell more during this phase because the nit or egg will look a bit dull yellow and still remains attached to the hair. Expect the nymph to look just like an adult just smaller, in fact it’s the size of a pin head. Then they mature after three molts and become adults around 7 days after hatching. So within 7 days of hatching, you will have a full grown adult lice crawling around. This is the dangerous part of the cycle, because these pest rapidly increase in numbers within days. As the nymph grows it sheds its skin every 3 days. 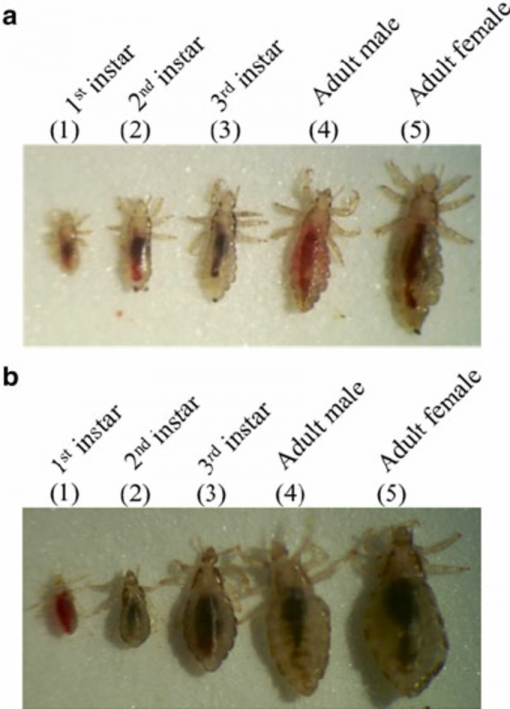 Below is the development stages of (a) head lice and (b) body lice. The adult louse is about a size of a seed and the difference between the nymph and the adult is simply the abdomen size. The abdomen in the adult is much longer. The lice adults is a tan grayish-white color. Keep in mind people or pets with dark thick hair, the color will vary and appear darker. The adult head louse can live up to 30 days on a persons head. But they can reproduce rapidly within a seven day period. Without a blood meal, the louse will usually die within 1 to 2 days. It’s important to understand the rapid rate which lice can spread. People have lost their hair using nasty products to get rid of them and yet they can keep coming back. Below is the cycle of life you will notice with lice. It’s best to seek a homeopathic remedy that will safely get rid of lice. Note, the above analysis is just one female and one egg laid. In real world scenarios, you will need to multiply those results by a factor of 10. Which is very scary! I hate to use the facts above because it may add a bit of fear into the situation. This is NOT our mission. We don’t wish to scare you, but we must share with you the reality and we want to let you know we are here to help. We have a unique homeopathic lice treatment spray that is safe and contains no pyrethrin. It’s a fantastic solution being used in schools and health facilities. If you have any questions, don’t be shy below is a comment box you can send your comment to us. We have a few lice experts on staff willing and able to help. Upon embarking on a journey across the globe, the founder of the company discovered amazing natural non pesticide solutions that remote cultures have been using for centuries. By living and sharing information with these ancient tribes, we formulated natural products which we believe infuses wellness into the home and human being. You can learn more about our story. Below is a quick preview of how we discovered these amazing natural healing ingredients.